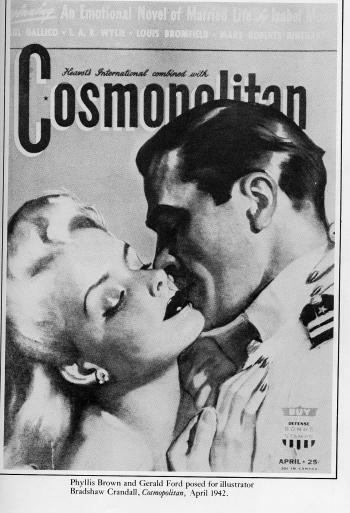 According to Carole Conover, in her book Cover Girls, President Ford also posed with Ms. Brown for a Cosmopolitan cover, issued in April 1942. I am attaching a photo of this cover (we do not have the cover at either the Gerald R. Ford Library or the Gerald R. Ford Museum). However, we at the Library cannot confirm or deny that it is President Ford in that cover. Just between us, let's say that it is future President Ford in that cover illustration, OK? Many thanks to Brooke and the entire Gerald R. Ford Library for their help uncovering this artifact! Oh by the way, you might enjoy this story from a couple of years ago as well. Different people in the world take the loans from various banks, because it is simple and comfortable. Excellent site, keep up the good work my colleagues would love this.. If you want to buy a house, you would have to receive the personal loans. Moreover, my sister always uses a financial loan, which is the most reliable. It makes me feel so surprise.I never know there is such a wonderful place that I can find what I need. I got really emotional reading this post! It is so amazing to read your story. I'm extremely inspired and as a reader I've enjoyed being distantly along for the ride! Bra information. Jag hade tur och hittade din webbplats från en slumpmässig Google-sökning. Lyckligtvis för mig, det händer detta ämne bara för att vara något som jag har försökt att hitta mer info om till forskning syfte. Håll oss den stora och tack så mycket. Bom estar visitando seu blog novamente, há meses para mim. Bem, este artigo que eu tenho esperado por tanto tempo. Eu preciso este artigo para completar minha missão no colégio, e ele tem mesmo tópico com o seu artigo. Obrigado, grande parcela.